This review of David Jones’s book appeared in Ceramics Monthly (June/July/August 2008). Firing is something between a technical primer (some basic information, some glaze recipes), a picture book, a gathering of artists, and a broadly considered analysis of the layers of cultural meanings of fire. His offerings are wide-ranging and eclectic; his reading broad and lively. He talks about Margaret Atwood’s ideas of the novel and John Cage and various French philosophers—pressing at the range of thought, making everything relevant to pottery and pottery relevant to everything. The heart of the book consists of sections about individual artists whose work illustrates various firing methods: wood (oddly limited to anagama kilns), salt and soda, electric, and less traditional approaches. Jones has built the book by soliciting responses from artists to a set of questions, so each part reflects the answers he received. 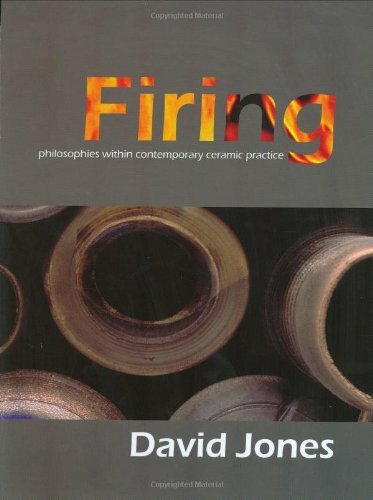 Many are lively and illuminate the correspondences between philosophical perspectives and firing practices. Others read more like standard artist statements. Unfortunately, the result is that some of the most significant artists have the least presence (as in the case of Nina Hole, one of the pioneers of site-built sculptural kilns). Others are quoted at length without any framing commentary. This at times haphazard feeling is reinforced by the way that Jones comes in and out of the text: sometimes writer, introducing and explaining chapter headings, sometimes compiler, patching together commentaries and statements and tantalizing quotations from many sources. The quality of the work illustrated is also somewhat inconsistent, and the quality of the images themselves even more so. Most do not include dimensions, making them difficult to read. In short: it’s best not to read Firing as we’ve been taught to read: starting at the beginning and moving toward the end, entrusting ourselves to the conventions of the book (both written and graphic). What promises to be a wide-ranging perspective becomes unwieldy and collapses inward. Sources are unevenly cited (and from the bibliography we can learn the vintage of the edition in Jones’ hands of the Heart of Darkness but not when Conrad wrote it). A parenthetical and petty aside, perhaps, yet it unlocks something of the book’s ahistorical and self-referential quality. Jones includes many images of his own raku pots, process and installations, and features so many of his students and colleagues that “Wolverhampton University” (where he teaches) rivals “wood,” “salt,” and “reduction” for the item in the index with the most references. So it’s best read in the spirit in which Jones writes: eclectically and personally. Leaf through the pages: stop at the images that excite you, and chase down those artists; read the epigraphs and quotations and then go read Bachelard or whoever grabs you. Jones has refreshing intellectual openness and curiosity, perhaps best evinced in the chapter on site and fire, which includes wonderful images: of John Roloff’s self-firing structures, such as the Humboldt Ship, and the hilarious Peter Lange’s Mercedes Mazdagama (“when the tyres burst, you know that the firing’s pretty much done”). In this section, conventional ideas of ceramics and firing are, literally at times, blown up. Jones’s generous willingness to engage with such a range of work and ideas is admirable and just what we need; the shaping of that into a book equal to his ambitions calls for a matching rigor. That kind of scholarship requires substantial support—the time to research, editorial oversight, production—and I wonder if some of the weaknesses of the book are not symptomatic of the perennial marginalization of clay and lack of sufficient funding for such projects.